Any given Sunday or Monday, if your radio’s tuned to KRUU 100.1 in Fairfield, Iowa, you’ll catch Rustin Larson hosting his talk show with the quirky-hip title: “Irving Toast, Poetry Ghost.” With an eye on creating a venue for poets, Larson spent several years in magazine publishing, but the venture ran its course. Still looking to showcase writers, he met with the KRUU station manager, who gave him free reign. “Irving” (the spirit of poetry who lives in the hearts of all) hit the airwaves in April 2008, and features live readings and interviews with new and established poets. 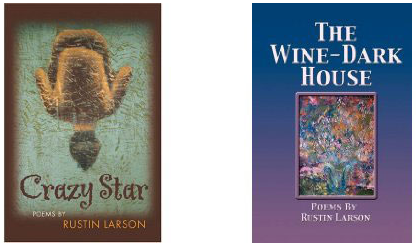 A published poet and writer himself, the five-time Pushcart nominee has authored three poetry collections, Loving the Good Driver (Mellen Poetry Press, 1996) Crazy Star (Loess Hills Books, 2005) and most recently–The Wine-Dark House (1st World Publishing, 2009). 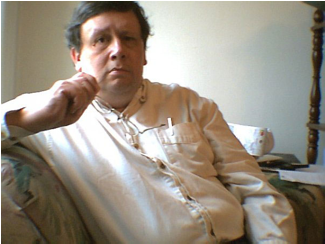 His work has appeared in The New Yorker, The Iowa Review, North American Review, Poetry East, Atlanta Review and others. Mr. Larson credits a high school creative writing class for piquing his interest and serving as a catalyst for future endeavors in the field. He received his B.A. in Literature from Maharishi International University in Fairfield Iowa, an M.F.A. in Writing from Vermont College of Norwich University in Montpelier, Vermont, and has taught writing in a variety of settings. Click here to read this wonderful review and samples of Rustin’s poetry, and interview, as he discusses his experiences as a student, poet, editor, teacher, blogger, and talk show host.